A total of 21 terrorists were “neutralized” during counterterrorism operations across Turkey over the past week, the Interior Ministry said Monday. 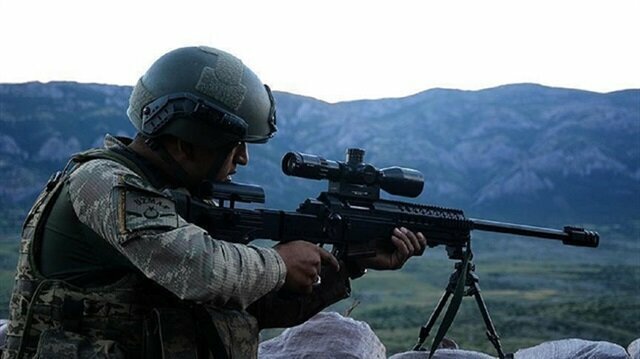 In its statement, the ministry said the Turkish Armed Forces carried out 1,388 counter-terrorism operations on May 14-21 with the assistance of land and air forces. The ministry said 11 of the terrorists were killed, eight others were captured, and two surrendered to authorities. During the operations, 190 people were arrested for allegedly aiding and abetting the PKK terrorist group and 35 others for their suspected links to the Daesh terrorist group. Also, another 527 people were arrested for suspected links to the Fetullah Terrorist Organization (FETO), the group behind the July 2016 defeated coup, which martyred 250 people and injured nearly 2,200, and 16 others for their links to leftist terrorist groups. Listed as a terrorist organization by Turkey, the U.S., and the EU, the PKK has been responsible for the death of some 40,000 people since the mid-1980s. Security forces also destroyed six shelters, including several caves and seven improvised explosives, during operations in the eastern provinces of Sirnak, Batman, Mardin, and Diyarbakir, the statement said. In addition, they seized 326 kilograms (718 pounds) of explosives materials, 63 hand grenades, 17 assorted weapons and 1,100 rounds of various ammunition. During the operations, security forces also arrested 768 suspects for crimes related to terrorism, and 75 others for organized migrant trafficking crimes, while more than 4,560 people were held for undocumented migration. After examining 803 social media accounts, the Turkish police’s cybercrime division launched legal proceedings against 413 suspects. A Turkish soldier was martyred and another one injured when an explosive device planted by PKK terrorist group went off in eastern Turkey, the Turkish military said on Sunday.In a statement, the Turkish General Staff said the blast targeted a passing by Turkish military vehicle in Dogubayazit district of Agri province.The PKK -- listed as a terrorist organization by Turkey, the U.S. and the EU -- resumed its decades-long armed campaign against Turkey in July 2015. Since then, it has been responsible for the deaths of 1,200 security personnel and civilians. Turkish security forces seized more than a ton of hashish in the southeastern Diyarbakir province, said the provincial governor's office on Sunday.In a statement, the office said around 1,261 kilograms (2,780 pounds) of hashish and 508,737 cannabis plants were seized in an operation spanning 26 different locations.Separately, in a counterterrorism operation, two shelters and a cave used by PKK terrorists in the Lice, Hazro and Kocakoy districts were destroyed, the statement read.The PKK -- listed as a terrorist organization by Turkey, the U.S. and the EU -- resumed its armed campaign against Turkey in July 2015.Since then, it has been responsible for the deaths of more than 1,200 Turkish security personnel and civilians, including women and children. Additionally, a total of 2,516 anti-drug and -contraband operations were carried out, during which 3,216 suspects were captured, according to the statement. The raids led to the seizure of 1,684 kg (3712 Ibs.) marijuana, 328 kg (723 lbs.) of heroin, some 37,433 pills or other forms of other illegal drugs, and nearly 63 tons (16,642 gallons) of smuggled oil.